4 4 P R I N T W E A R M A R C H 2 0 1 9 If the answer to this question is yes, then proceed to your pitch. If not, then you've gotten a nice spa day out of the deal and you can move on to your next option. Another bonus of visiting a spa is that it gives you the opportunity to see what branded goods they are currently using. When examining the goods they offer, you want to look at two things. One is the quality of the items. 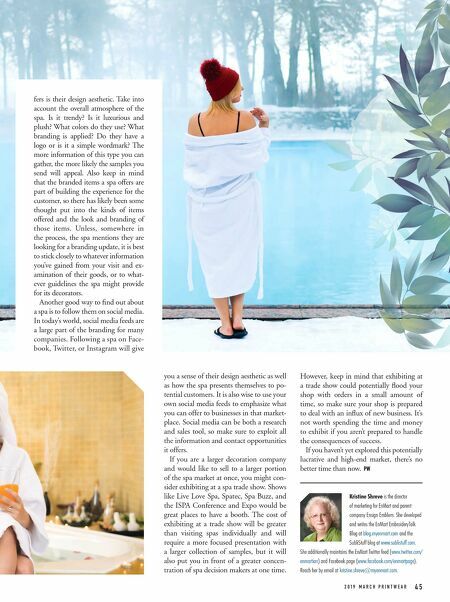 A spa experience is generally about luxury, so make sure you look at the weight of the towels and robes, the plushness, and the materials of which these items are made. If you decide this spa is one you want to pitch, this informa- tion will be helpful when you're deciding what samples to provide. You definitely don't want to offer samples that are lesser quality than what is currently in use. The goal is to offer the same or better quality at a price that is better than what they cur- rently pay. Granted, you most likely won't know exactly what they're paying, but if you can do some brand research, you can probably compile enough data to make a reasonably educated guess. The second thing to consider when looking at the branded goods a spa of- One thing to remember about spas is that they're generally about luxury, which means cost isn't as much of an issue as it might be with other businesses. Robes, towels, etc. are considered part of the ambiance. You should also keep in mind that spas are often about being eco-conscious, so products that fit into that lifestyle may be a big hit.